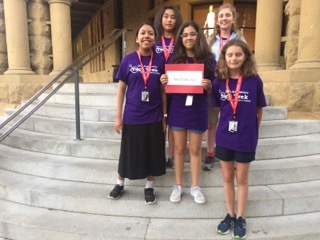 The Tech Trek Science Camp was developed by California AAUW to encourage girls finishing the 7th grade to explore the fields of math and science. Branches raise funds to cover each girl's attendance and selects from candidates. Our San Francisco Branch of AAUW has sent girls to the camp each year but one. Last year we sent fifteen girls to Stanford University and Sonoma State University. The families did not have to provide any money for this opportunity. 1) Click on the pledge form. Any amount helps! To kick off Computer Science Education Week, Lockheed Martin has signed on to help grow Tech Trek in 2015 so that together we can inspire even more innovators of tomorrow! Lockheed Martin has invested in Tech Trek with a $90,000 grant to AAUW. $40,000 is for national AAUW to expand camps and $50,000 is for 4 existing camps. This means Camp Curie and Camp Hopper each receive $12,500. This is an unrestricted grant. Who can attend Tech Trek? We are seeking girls with an interest in science, mathematics, and technology. Students who can follow directions, enjoy new settings and people, and work well in groups are great candidates. Once nominated by their Science Teacher, the girls fill out a questionanire, write a short essay, are interviewed and finalists selected. Parents are included in the process. Tech Trek is a program established in 1998 by the California Division of AAUW. The first week long camp was held at Stanford University. This year eight campuses will participate. They will send you the nomination form and answer any questions or concerns. Ask your teacher to apply and/or share this information with other students or parents. We hope you will be very excited and will consider this special opportunity. Again, please check out the CA Tech Trek information at Tech Trek Camp.